These organizations can be further divided into categories: universities, funding organizations, support organizations (like incubators, accelerators, co-working spaces etc. ), research organizations, service provider organizations (like legal, financial services etc.) and large corporations. Different organizations typically focus on specific parts of the ecosystem function and/or startups at their specific development stage(s). People from these roles are regarded as linked together through shared events, activities, locations and interactions. As startup ecosystems are generally defined by the network of interactions among people, organizations and their environment, they can come in many types but are usually better known as startup ecosystems of specific cities or online communities (although some may say that due to social networks, the entire globe is just one big network of startup ecosystems). In addition, resources like skills, time and money are also essential components of an start-up ecosystem. The resources that flow through ecosystems are obtained primarily from the people and organizations that are active part of those startup ecosystems. By events and meetings with and between organizations and different people, these interactions play a key role in the movement of resources through the system helping to create new potential startups or strengthening the already existing ones and hence influencing the quantity of startups build. Failures of start-ups, release people witm improved skills and time for either establishing a new start-up or joining an already existing one. Start-up ecosystems are controlled by both external and internal factors. External factors as financial climate, big market disruptions and big companies transitions, control the overall structure of an ecosystem and the way things work within it. Start-up ecosystems being dynamic entities—invariably, they are initially in formation stages and once established are subject to periodic disturbances (like the financial bubbles) passing afterwards to the recovering process from some of those past disturbances. Start-up ecosystems in similar environments but located in different parts of the world can end up doing things differently simply because they have a different entrepreneurial culture and resources pool. The introduction of non-native people knowledge and skills can also cause substantial shifts in the ecosystem functions. Internal factors not only control ecosystem processes but are also controlled by them and are often subject to feedback loops. While some of the resource inputs are generally controlled by external processes like financial climate and market disruptions, the availability resources within the ecosystem is controlled by internal factors like people and organizations ability to contribute towards the ecosystem. Other internal factors include startups success and failures succession along types of people and available skills. Although people exist and operate within ecosystems, their cumulative effects are large enough to influence external factors like financial climate. People diversity also affects startup ecosystem functions, as do the processes of disturbance and succession. Startup Ecosystems provide a variety of goods and services upon which other people and companies depend on and thus, the principles of startup ecosystem management suggest that rather than managing individual people or organizations, resources should be managed at the level of the startup ecosystem itself. Classifying start-up ecosystems into structurally similar units is an important step towards effective ecosystem management. When management is applied to the whole start-up ecosystem, rather than just single start-ups or organizations, it is termed start-up ecosystem management. Start-up ecosystem management is driven by explicit goals, executed by policies, protocols, and practices, and made adaptable by monitoring and research based on our best understanding of the interactions and processes necessary to sustain ecosystem structures and functions. Thus,the purpose of it is to manage areas at various scales in such a way that ecosystem services and resources are preserved while appropriate resource use and options for livelihood are sustained. Due to the nature of the start-up ecosystem management including the capability of catering needs for ecosystem management on a long term bases with its own sustainability through turmoil and disruptions, the responsibility is typically shared between those with such abilities. A fundamental principle is the long-term good production sustainability for start-ups by the ecosystem; "intergenerational sustainability [is] a precondition for management, not an afterthought". It also requires clear goals regarding future trajectories and behaviors of the system being managed. Other important requirements include a sound understanding of the system( including connectedness, people and organization dynamics) and the context in which the system is operating. Other important points include an understanding of the role of people, talent and money as components of the ecosystems and the use of adaptive management. Some systems for startup ecosystem management exist, ranging from documented knowledge and tools, to online platforms, all the way to specifically developed comprehensive infrastructure solutions. Since start-up ecosystems are dynamic entities—invariably, they are subject to periodic disturbances and are in the process of recovering from some past disturbance. When an startup ecosystem is subject to some sort of perturbation, it responds by moving away from its initial state. The tendency of a system to remain close to its equilibrium state, despite that disturbance, is termed its resistance. On the other hand, the speed with which it returns to its initial state after disturbance is called its resilience. From one year to another, ecosystems experience changes in their people, organizations and environments. A financial turmoil constitutes short-term variability in environmental conditions. The pool of people resources also vary from year to year, building up during downturn for bigger companies and crashing as they gear up their recruiting. Longer-term changes also shape ecosystem processes—where the biggest startup companies eventually make big exists releasing capital and talent to the start-up ecosystem. In addition to it, disturbance plays also an important role in startup ecological processes. The frequency and severity of disturbances determine the way they impact in the start-up ecosystem functions. Major disturbances like a startup bubble burst leave behind an investment dry environment. Startup ecosystems that experience severing disturbances undergo primary succession. Less severe disturbances like individual start-up failures or support organization reorganization result in secondary succession. More severe and frequent disturbances result in longer recovery times. Start-up ecosystems recover more quickly from less severe disturbance events. 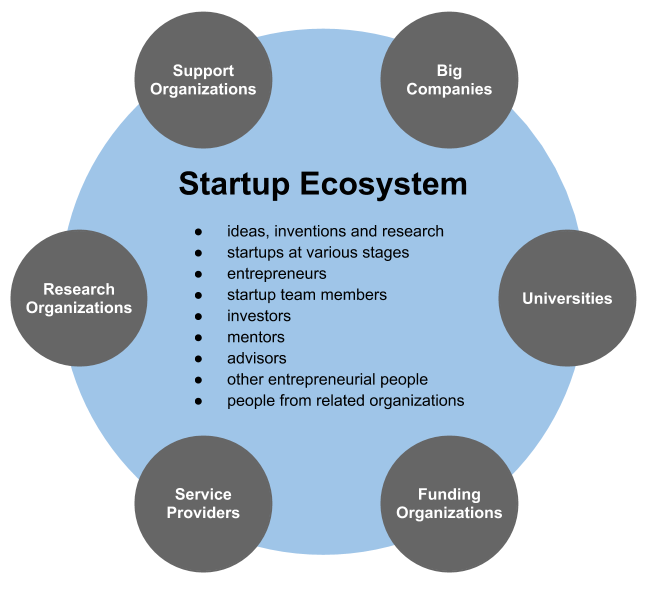 Start-up ecosystems can be studied through a variety of approaches—theoretical studies, studies monitoring specific start-up ecosystems over long periods of time and those that look at differences between start-up ecosystems to elucidate how they work. These studies can be carried out in a variety of scales. There are several independent studies made to evaluate start-up ecosystems to better understand and compare various start-up ecosystems and to offer valuable insights of the strengths and weaknesses of different start-up ecosystems.